The Commerce Bank MasterCard World Elite currently has an Informr score of 9 out of 10. This score is based on our evaluation of 1 sources including reviews from users and the web's most trusted critics. 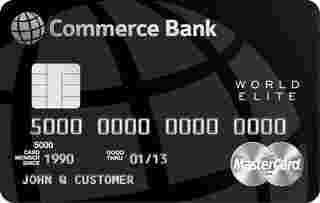 Commerce Bank MasterCard World Elite is typically available to those with excellent credit scores (650 or greater). The Commerce Bank World Elite MasterCard has quite a bit to offer. If you like a card that gives you freedom in earning cash back that can be redeemed for just about anything, then you may want to consider this card. Received a 5% annual point dividend when you make $50,000, or more, in Net Merchandise Purchases.